The villa was built in 1498 by Cardinal Raffaele Riario and his nephew Ottaviano who enclosed a large piece of land at the base of the Cimini hills to transform it into a hunting reserve. 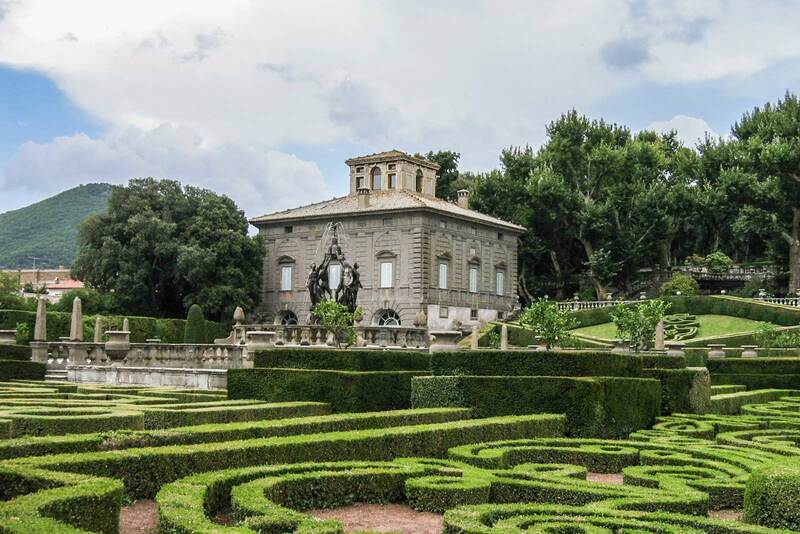 The most important part of the villa’s history was around 1569 when Cardinal Giovanni Francesco Gambara, with the help of Vignola, built the present day villa with its Italian garden and monumental fountains. The fountains and the villas were built on the eastern side of the property where the land was very steep. The difficulties connected to the site, were instead exalted thanks to the water games of the fountains. The main fountains are those of the Four Moors, the Deluge, the Pegasus and the Giants where the fountain, shaped like a large table, was used for dining. Cardinal Gambara celebrated his family name with the chain fountain where the links recall the form of the crayfish (gambero) and the river. In the two small villas built by Cardinal Gambara and Cardinal Montalto there are fresco cycles and works of famous artists such as Antonio Tempesti, Agostino Tassi, Cavalier d’Arpino and Orazio Gentileschi plus members of the Zuccari school. The frescoes have a variety of themes from mythological ones to marine and grotesque scenes. In 1656 Villa Lante and its gardens became the property of the Lante della Rovere family and remained theirs until 1933.